Our Commercial Grade Wave Pro banners make highly visible and impressive options for your indoor and outdoor displays. 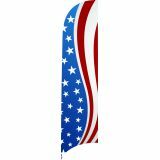 100% made in USA, our banners are made with heavy duty Jet Flag material and Single Face Reverse imprint, so that they are visible on both sides. Our banners can stand up to a towering 12’ in height grab the attention of everyone from a long distances. Be it as a tradeshow display or store promotional banners, our wave pro banners are special crowd pleasers. Shop from our complete line of Wave Pro Banners right away and get the best prices, quick shipping, and much more! Our Wave Pro Banners Are An Exciting Way To Get Your Message Across! The Wave Pro Banners from Tuff Flags make a dazzling spectacle and an exciting way to get your message across during business events and tradeshows. Well suited for both indoor and outdoor displays, our heavy duty banners will stand out in the crowd and grab everyone’s attention. 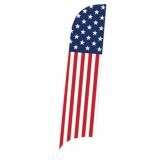 Choose from a range of models like Patriotic Abstract U.S. 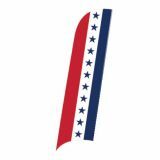 Flag Wave-Pro Banner and Patriotic Horizontal U.S. Flag Wave-Pro Banner among many others. We also have a collection of Marketing Banners and kits with a variety of shapes and presentations to cater to your diverse needs. Browse our collection of Wave Pro Banners to choose a model that matches your needs. Not sure how to go about it? 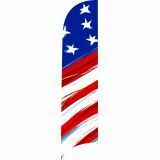 Call us at our toll free number (888) 287-3524 or email us at customercare@tuffflags.com for assistance.